Roberto Burle Marx (1909–1994) remains one of the leading landscape architects ever. The significance of his landscape design lies in his use of abstract shapes that rarely employ symmetry, and his use of tropical, mainly Brazilian, flora. His distinctive and widely acclaimed work has been featured and referenced in numerous sources, yet few of Burle Marx’s own words have been published. This book of previously unpublished lectures fills this void. 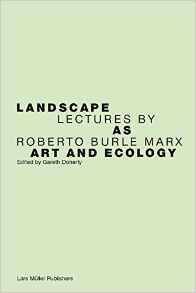 The lectures, delivered on international speaking tours, address topics such as: “The Garden as an Art in Living,” “Gardens and Ecology,” and “The Problem of Garden Lighting.” Their timely publication helps shed light on Burle Marx’s distinctive style and ethos of landscape as a way of life.